The web, with a few exceptions of course, is a borderless world. Being able to easily translate a website into a different language can make a big difference in terms of attracting more visitors. If you make it easy for those that use a different language, they will be more likely to return to your site. The plugins below aim to help you do that. The world of WordPress translator plugins is messier than I expected. Many I tried simply didn’t work. Some wanted to put links on my site or even take over my advertising space. One actually crashed my blog completely. Of course thoughts of the Tower of Babel sprang to mind. Below are the two that survived the testing. The first will translate your entire site at the click of a button. The second will translate selected texts within a post. Both have their uses depending on your needs. This plugin works firstly by using iframes with the translation engine website. If you have set up caching, however, once a page has been translated once, you will not need to go back to the translation engine unless you have set up the plugin to do so. Let’s take a look at the plugin in action. Once activated, you use a widget to place flags for different languages in your widgetized areas. We can see in this shot, the entire site has been translated and rests in an iframe at Google Translate. On the settings menu, you can choose your translation engine and which languages you would like to offer your site to be translated to. You also have the option of choosing the number of flags per row for design sake. There are also a few other options, such as how often a translation can be requested. You will need to make sure your site is not requesting too many translations in a short amount of time, or you could be banned from the translation service. The gTranslate Shortcode plugin is a different animal from the plugin above. This plugin is meant for those times when you have limited amounts of text in a foreign language that you may need translated to the language of the blog. So, for example, let’s say your blog is in English, but you have some text in French that you would like to place in a post. This plugin allows you to place the original French text in the post. There may be several reasons why you would want to do this. Perhaps many but not all your readers speak both French and English. Perhaps for accuracy’s sake, you want to make sure you are not misquoting something, yet you want to provide a translation for it as well. Perhaps you are an academic and feel providing the original text is required for authenticity, etc. 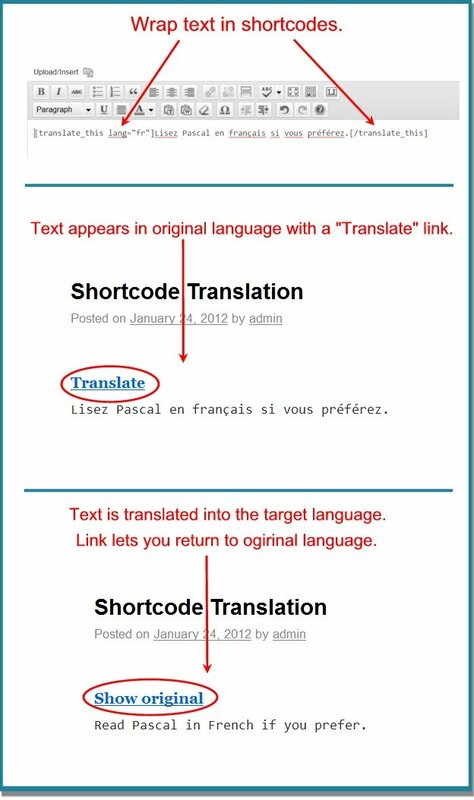 After placing your foreign language text in the proper shortcodes (you must identify the language of the text in the shortcode), a link then appears above the text that will allow the text to be translated into the language of the blog via Google’s translation engine. Once the text is translated, the link above the text automatically changes to allow the reader to return to the original text. Obviously this plugin is not what you will want if you would like your whole site to be translated. 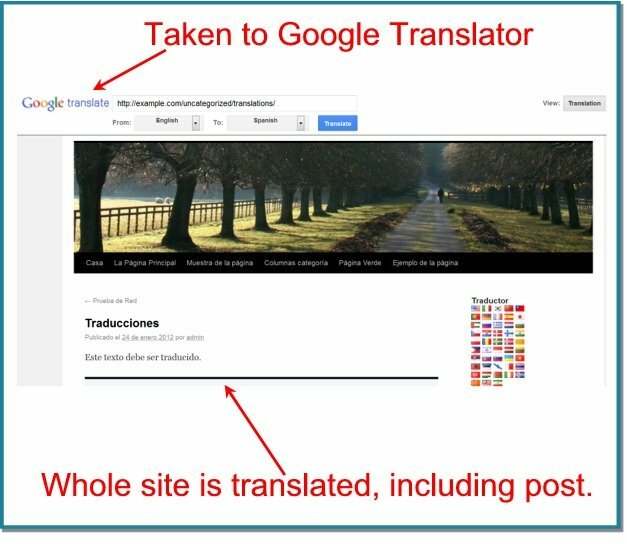 But its one big advantage over a complete site translation is that it is much faster than a complete site translator. And that can make a big difference for your reader if you only need an occasional piece of text translated.